A kind assessment of my gardening style is “Desert meets Country Cottage.” Others might call it chaos. This speaks to a complete lack of restraint on the part of the gardener. 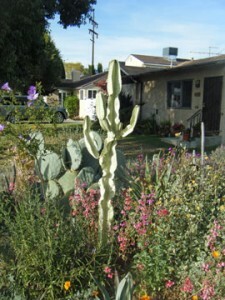 No time is this more evident than in April when California poppies, tall pink Clarkia, Blue Flax, and Lavender “Spanish Dancer” all but obliterate the cacti and succulents that form the bones of the garden. I am as incapable of pulling up flowers as I am torturing kittens. Hence the mess. Last spring, I was gazing out the window at my progeny and saw a couple looking at my garden from the street. They turned to each other and kissed. My thoughts exactly! 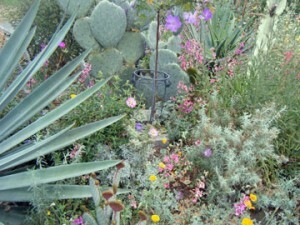 April 6-7 is the Theodore Payne Foundation California Native Plant Garden Tour. It is a fabulous self-guided tour for a wonderful organization. There is a companion art exhibit of California wildflowers at the Huntington Library in San Marino. Awesome, Sarah! What a great reward. Stunning, as always! I want to see more! Please post more pictures.